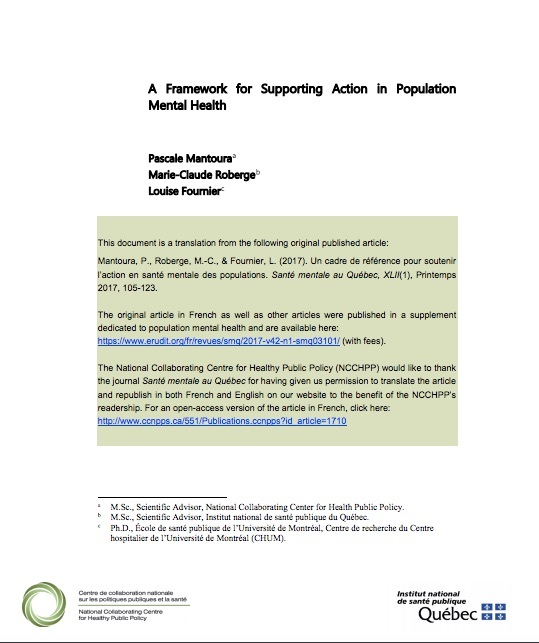 This article presents the momentum for change at the policy level within the field of mental health, and we present a framework to support population mental health action that builds on previous work developed at the NCCHPP. The article also illustrates how the application of a populational responsibility perspective, as it is defined in the context of Québec, facilitates the implementation of the various elements of this framework. To learn more and download this article, click here. Interested in this subject? Check out our related collection, Population mental health promotion for children and youth. The project has resulted in a collection of topical papers, alongside general resources, including background information and a resource scan, to help public health practitioners engage with the topic from a variety of perspectives.